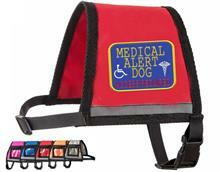 This hanging patch tag has an identifying patch on both sides, finished edges, swivel snap hook that can be attached to the dog’s collar, vest's D-ring, carrier or bag. Simply clip it on and off. · This patch measures approximately 3" X 3"
Custom PVC ID Tags for your working dog. Each card comes with a United States Federal Law notice on the back.